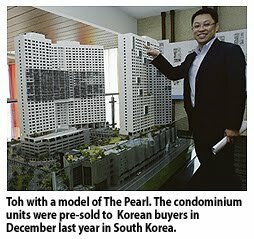 Property developer IJM Land Bhd has seen overwhelming response from Korean buyers for its RM500 million The Pearl Regency development on Penang island. Apart from an en bloc sale of the entire commercial portion of the project comprising 83 commercial units worth RM90 million to a Korean party, IJM has also seen 40 per cent of 574 condominiums sold to Koreans. The units, which were launched in Penang yesterday, were pre-sold to the Koreans in December last year in South Korea. "The buyers of the condos are mainly Korean retirees and families who send their children to Penang to brush up on their English skills," IJM Land general manager Toh Chin Leong told a media briefing in Penang yesterday. IJM Land established a sales presence in South Korea at the end of 2008. The residential units are priced from RM478,314 up to RM1.3 million each, while the commercial area is priced at RM750 per sq ft. The project, which sits on a 20ha site close to the Penang bridge and next to the Tesco hypermarket and e-Gate, which is a popular retail and food and beverage hub, is slated for completion by early 2013. The project, sited on freehold land, has been marketed to potential overseas buyers in countries like South Korea, Indonesia, Singapore and Hong Kong with the help of local private hospitals in Penang, international schools, along with golf and country clubs. SINGAPORE'S CapitaMalls Asia Ltd could raise about RM860 million from the listing of its Malaysian assets in a real estate investment trust (REIT) on Bursa Malaysia. 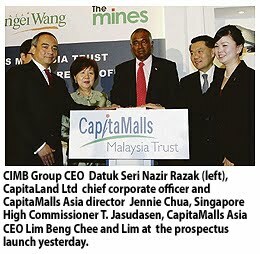 Held under CapitaMalls Malaysia Trust (CMMT), the portfolio is made up of Gurney Plaza in Penang, Sungei Wang Plaza in Kuala Lumpur, and the Mines in Selangor. CapitaMalls Malaysia REIT Management Sdn Bhd is the manager of CMMT. At the prospectus launch in Kuala Lumpur yesterday, chief executive officer Sharon Lim said CMMT is Malaysia's largest listed "pure-play" shopping mall REIT by market capitalisation and property value. According to its prospectus, CMMT has the right of first refusal for retail properties located in Malaysia that CapitaMalls Asia intends to buy and this includes the Gurney Plaza extension. CapitaMalls Asia has set aside RM3.5 billion to acquire more shopping malls and retail properties in Malaysia. Asked on CMMT portfolio expansion, Lim replied, "we're going through a couple of evaluations. We can't reveal until they are concluded". CMMT is offering 1.35 billion units for sale under the initial public offering (IPO). A total of 786.522 million CMMT units are being offered to institutional investors in Malaysia and overseas and to retail investors in Malaysia only. CMMT's parent CapitaMalls Asia will retain a stake of 41.74 per cent. However, if an over-allotment option of up to 15 per cent of the offering is exercised, CapitaMalls Asia's stake in CMMT will drop to 33 per cent. PETALING JAYA: CapitaMalls Asia Ltd, one of Asia’s largest listed shopping mall developers, owners and managers by property value and geographic reach, has launched the prospectus and retail portion of what will be the largest shopping mall REIT (real estate investment trust) in Malaysia to date. CapitaMalls Asia is part of Southeast Asia’s largest property developer Singapore’s CapitaLand Ltd.
Its initial portfolio of three shopping malls – Gurney Plaza in Penang, Sungei Wang Plaza in Kuala Lumpur and The Mines in Selangor – has a total net lettable area of 1.88 million sq ft and has been valued at RM2.13 bil. The CMMT IPO will have a total of 1.35 billion units in issue, of which 719 million units were offered to institutional investors at between RM1 and RM1.10 each in late June and 67.5 million units for individual investors at an indicative price of RM1.08 yesterday, with a forecast distribution yield of 6.9% for 2011. The final price will be determined on July 8. CapitaMalls Asia CEO Lim Beng Chee told a press conference that occupancy and rental yields had increased for all three malls in its stable despite a weak economy in the last two years. “We see acquisition opportunities in Malaysia’s shopping mall sector, with its fragmented ownership structure. “CapitaMalls Asia will give CMMT a right of first refusal over any retail properties that we may acquire in future, including the extension that is being carried out at Penang’s Gurney Plaza. If acquired, Gurney Plaza extension will increase CMMT’s asset size by about 11%,” he said. CIMB Investment Bank Bhd, JPMorgan Chase & Co and Maybank Investment Bank Bhd are jointly managing the IPO sale. “As part of our long-term commitment, CapitaMalls Asia also plans to set up a Malaysia retail property fund to acquire and develop retail properties in Malaysia. CMMT will similarly have a right of first refusal over this pipeline of retail properties,” Lim said. Individual investors will get a refund if the final price for institutional investors is lower than the retail price. CMMT’s sponsor, CapitaMalls Asia Ltd, will retain a stake of 41.74% in CMMT. If an over-allotment option of up to 117 million units is exercised, CapitaMalls Asia’s stake in CMMT will be 33%. The IPO follows the RM1.5bil raised by Sunway Real Estate Investment Trust in its initial sale last week and underscores rising investor appetite for equities in Malaysia amid an economic rebound. AEON Co (M) Bhd is buying three pieces of leasehold land and two parcels of state land in Perak, measuring a total 6.9ha, for RM27.13 million. It told Bursa Malaysia yesterday that it is buying the land to expand its retail business by opening new shopping centres and outlets. PETALING JAYA: Gula Perak Bhd said has proposed to sell two hotels to Hong Kong-based Time Glory Investment Ltd for a combined value of RM193.9mil to pay off outstanding debts, the PN17 affected issuer told Bursa Malaysia yesterday. Gula Perak had, on April 22, announced that the redeemable secured notes (RSN) totalling RM287.3mil had expired. As the properties — Dynasty Hotel in Kuala Lumpur and Empress Hotel in Sepang – are charged to the chargee under the RSN, the proceeds arising from the proposed disposals will be utilised towards the repayment of the outstanding RSN.